Cool, I was wondering if you guys would be having books in Target again. So will it just be the movie adaptation in Target or will any of the prequel books see mass market release? Because I remember seeing both the prequel and movie adaptation in Targets and TRU's two years ago. Does IDW have plans again to have the prequel books (and maybe even Reign of SS) put to voice actors on DVD like last time...or is that too far off to know yet? Because that was wicked neat! That's interesting. Please excuse my ingnorance, but if you're free to explain, how does that work? I mean, that's a lot for you guys to produce to have it given away. 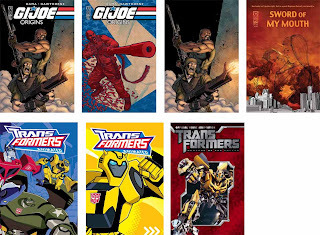 Unless the retail store paid IDW for that many copies and are giving it away with the purchase of something else? That's pretty cool though. When might me find out which prequel book it is and which retail store is doing this? That's too bad about no one signing on yet to animate more trades. Thanks for taking time to answer.